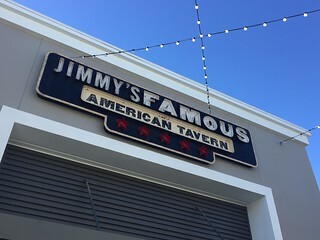 Jimmy’s Famous American Tavern, or better known as JFAT, recently introduced a new brunch menu. I was happy to learn about it and my wife and I recently visited their location in Brea. JFAT is located next to Whole Foods in the Village at La Floresta mall on Imperial Hwy just east of Kraemer Blvd in Brea. The Village at La Floresta is marketed as the hip spot for retail shopping and dining on the east side of OC. The restaurant is beautifully decorated and quickly set the mood for Christmas. Garland was wrapped everywhere with ribbon and bows. Christmas trees were fully decked out with shiny glass ornaments. 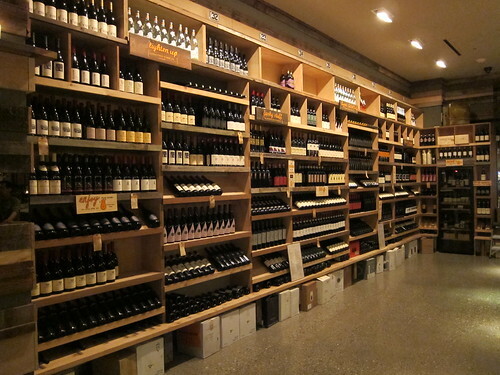 An impressive lighted display of super premium wines is located near the entrance. Bottles of wine were lined up on the bar and they also had a fair number of craft beers on tap. TV screens were playing live sports, but it didn’t overpower the experience like a sports bar. 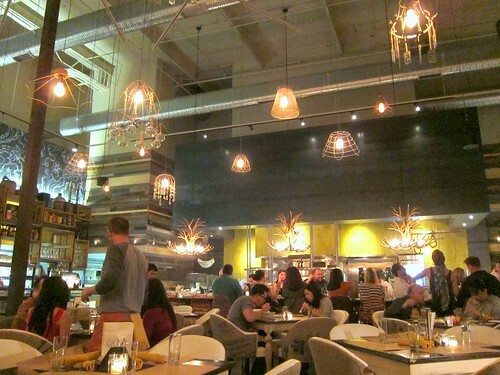 The restaurant is large and spacious. It is obviously designed for people to get together and converse over a good meal. In fact while we were there, there was a group of 8 that were enjoying brunch. 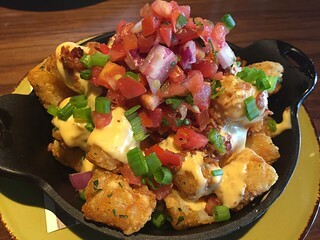 Totchos are simply Tater Tots topped with melted cheese and salsa fresca. Simply stated, they are nachos made with tater tots instead of tortilla chips. Since I favor tater tots over tortilla chips, I had trouble eating just one bite. Knowing that this would be a meat heavy meal, I ordered the Charred Brussels Sprouts. This came with smoked applewood bacon, pinenuts and underneath it was some maple syrup. I scooped downwards in the dish to gather the maple syrup. This was a great combination of flavors and textures and was one of my favorite items that day. 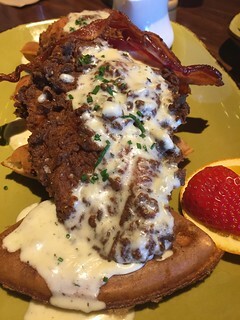 The Buttermilk Fried Chicken & Malted Ale Waffles was served topped with a thick and creamy thyme gravy and applewood smoked bacon. After pouring pure maple syrup on top of it all, I enjoyed the various taste sensations, crunchy, salty, sweet and smoky. I was quite happy with this dish. PS. If you're a female travel blogger, be sure to check out the summit schedule and see if you'd like to join! 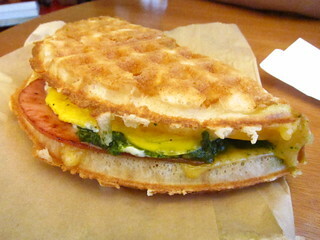 Waffle sandwiches! That's all you need to know, really. Not just sweet waffle sandwiches, but savory ones like fried chicken or ham and eggs. Because who needs bread when you have waffles? Read my review from their other location. This small spot is hidden in an office building but rather hard to find, but it's worth it to try their award winning burgers. The meat is ground fresh multiple times a day, making for a great burger that goes well with their strawberry basil lemonade. Even though great ramen places have opened up all over the LA area in the past year, Santouka still serves some solid ramen, and some of the beste in Orange County area. Santouka is an oldie but goodie, you can't go wrong with this place when you have a ramen craving. 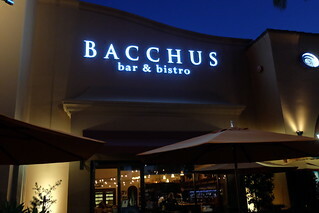 I recently visited Bacchus Bar and Bistro in Irvine. 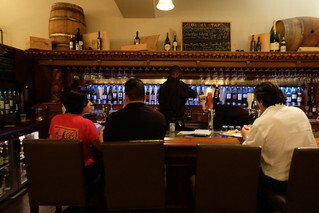 It is an upscale wine and craft beer bar. They also have a small kitchen where prepare a selection of appetizers, burgers and entrees. The exterior of Bacchus is deceiving because it sits in a shopping center but once you step inside, you are in an inviting and spacious area with a wine bar on one side and a retail space on the other. Bacchus offers over 350 bottles from around the world and has a wine bar where they can pour up to 60 different wines by the glass. I learned that they received the Wine Spectator award in 2014. 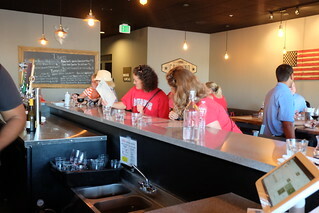 Bacchus also offers 6 craft beers on a rotating tap along with 20 bottled craft beers. Glancing at the list of twenty, only five were from California. Belgian beers were prominently featured; there was a selection from Iceland and one from Italy. Like their wines and craft beers, geographic diversity seems to be the desire for the focus of their cheese offerings. France topped the list with five different varieties. Holland was second with two and the US only had a single offering: Barely Buzzed from Utah. Fans of cheese from California, Oregon and Wisconsin may feel snubbed to not make the cut. Nuts, olives and various crackers and breads were also available. 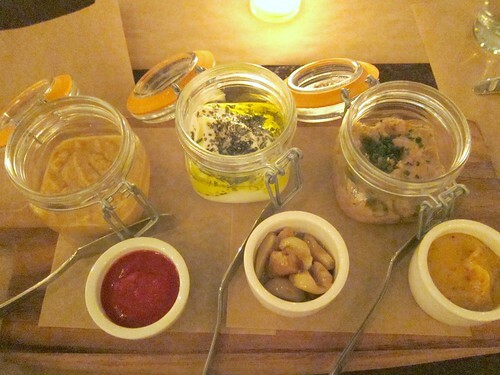 I was intrigued with the yuzu marmalade and the fig jam offerings as they probably go well with the crackers and breads. Some items are gluten free. I repeated what my server said, “lobster grilled cheese” several times thinking that he had it mistaken for lobster mac & cheese. 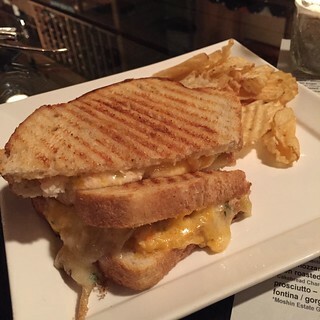 Brie and cheddar were melted with pieces of fresh lobster and served on toasted sourdough. Brie cheese added to the ‘gooey’ factor making each bite a multisensory and delicious experience. Sporting events and concert venues don’t typically serve cutting edge food and so I’m always on the lookout for restaurants that are situated near these types of establishments. 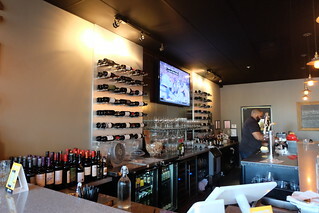 Calivino Wine Pub opened its doors in May 2014; located on Katella Ave in Anaheim, they are ideally situated between the Honda Center and Angel Stadium of Anaheim. The interior of Calivino Wine Pub resembled a modern cafe: stylish chairs and tables, spot lights from ceiling and single seating by the bar. Colorful wine bottles adorned the wall of the bar area. 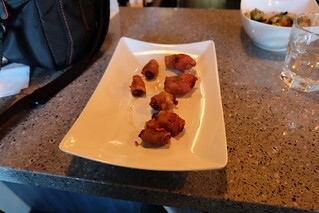 I began with their bacon wrapped dates and a glass of Clayhouse Adobe White Blend. 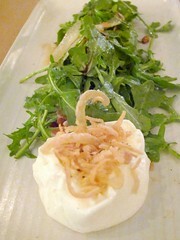 The saltiness of the goat cheese combined with the natural sweetness of the dates and honey paired quite nicely. The white blend was a good beginner’s wine. 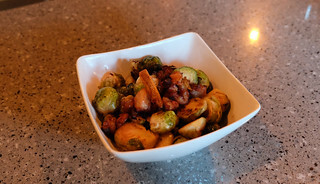 The honey roasted brussel sprouts with pork belly had a crisp exterior and I thought that the sweetness of the honey combined with the salty and smoky nature of the pork belly was an effective way to serve an otherwise bland vegetable. I paired this with an Argentine Malbec: Elsa Bianchi. This soft wine is ideal for the person that isn’t fond of bold complex red wines and is well suited for appetizers. Newport Beach Restaurant Week starts today, January 17, and goes on until January 26. I took the chance to explore some Orange County eats, since I'm not there much, and tried out the Restaurant Week menu at Great Maple Libations and Seasonal Plates, located inside the Fashion Island. The Great Maple will have a 3-course dinner menu for $30. 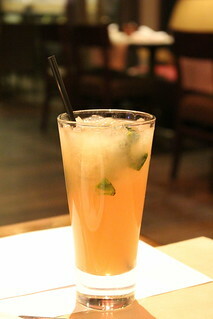 After driving to OC in LA traffic, we needed a refreshing cocktail to calm down! Lucky for us, the cocktails here were pretty good. We started with the gin drinks. 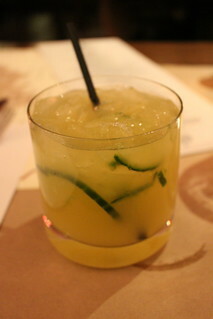 I had the Midnight Pineapple with cucumber and caramelized pineapple. I like that the drinks here weren't too sweet. This was refreshing and hit the spot after the long drive. 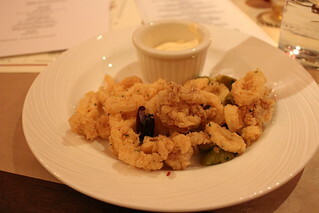 The salty olives in the calamari were a great and unexpected addition. More fried calamari should come with olives!